The mountain environment is spectacularly stimulating and at ZigZag, we believe that everyone should have the opportunity to experience it. We aim to make skiing an inclusive activity and as such, numerous instructors on our team have undertaken specific training qualifying them to teach skiers with special needs. Our compassionate handiski instructors are proud to have the skills and qualifications to teach skiers with reduced audio, visual, physical, mental and learning capabilities. With plenty of experience teaching adaptive skiing both in France and internationally, you’ll be in strong, gentle hands, safe in the knowledge you can learn in full security. For those with physical disabilities who’d like to learn to ski autonomously, we offer Uniski and Dualski tuition. A specially trained private handiski instructor will help you to manage turning, stopping and getting back up when you fall over, with the help of your “outriggers” (poles with skis on them). You’ll also be taught to ride button lifts and chairlifts as independently as possible. 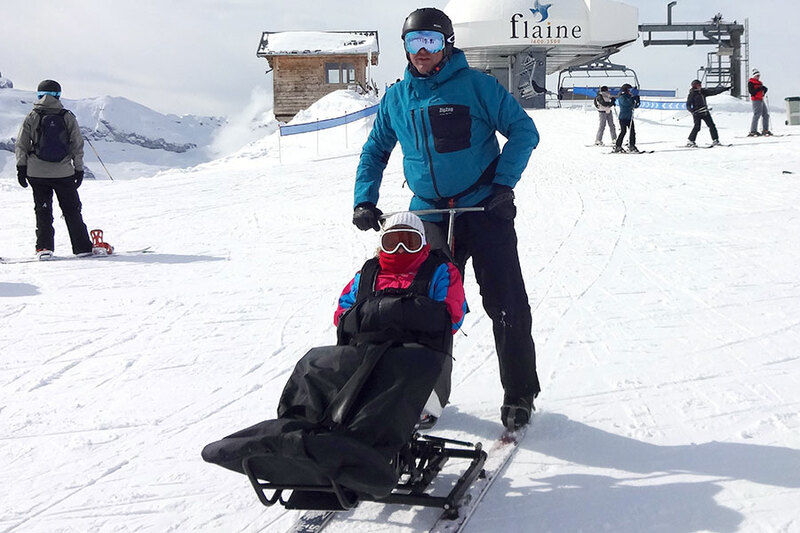 For those who’d like to experience the thrills of skiing but are limited by age, injury or disability, we offer a fabulous Taxi Ski (or tandem ski) service. It’s a great way to get the whole family skiing together! ZigZag is proud to work in partnership with Ski 2 Freedom, an independent non-profit organisation established to encourage and promote snow-sport and mountain activities for disabled, special needs and disadvantaged children and adults. We have also been the ski school of choice for many years for UK community special school Swanwick Sports College. The kind of handiski skiing tuition or accompaniment we can offer depends on the nature of each person’s special needs, but in principle you can participate in all the winter activities available. For information about finding adapted accommodation, parking, transport, dining, shopping and other special needs services in Samoëns, visit the Samoëns Tourist Office‘s website. For more information please don’t hesitate to contact us by email.